Can we still portray Justice as evenly balanced scales? I was a total believer in the evenly balanced scales of justice, even after my first court experience, decades ago. I had been summonsed to court after my roommate departed and I didn’t have money to pay the whole rent. I planned to argue that half the rent was still due from the other signer of the lease. Frank Gomez was my landlord and the plaintiff. Prior to filing the court case Gomez had called me and said that if I didn’t pay all that was owing before five o’clock p.m., that he and a posse were coming at midnight and they’d get me out. In my mind’s eye I saw them thundering down Don Diego street toward my home. Now, this is Santa Fe, and that was the 60s. To give you a picture of what it was like, I’ll tell you about the day I and my hometown friend, Dee Drake, arrived in Santa Fe in 1967. We were greeted by men with rifles standing all around the courthouse on Grant Street. They weren’t there for us in particular, of course, but the striking sight made a deep, personal impression. I’d never before seen men with rifles in their hands, unless they were dressed in red and going out to get a deer. But, here were all these men, who apparently were The Law. I soon learned that it was the day of the arraignment of Reies Tijerina who had led a raid on the Tierra Amarilla Courthouse, in Rio Arriba County, Northern New Mexico in an effort to regain land that had been granted to local people by Mexico prior to New Mexico becoming a part of the United States. To me, it sounded rather heroic. 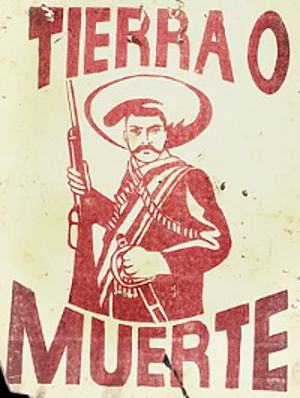 Denver’s public television station, KBDI-TV, did a documentary entitled, Tierra o Muerte (Land or Death), with dramatic video footage and views from both sides, but so far all I can find is the trailer for it. Watch trailer. The documentary shows Tijerina and his followers, who were referred to by many as terrorists, as well as Thomas B. Catron who had gotten 3,000,000 acres of the land in question. Decades after my arrival in Santa Fe a friend of mine, Sally Cruz, whose father still proudly wore his long, traditional braids, said that Catron had taken much land by telling people, “Give me your deed and I’ll put it in my safe.” He said it in a way that sounded like he would keep it safe, for them. The typeface is Barbaric, a font designed by Luc Devroye. His website makes for Great Reading. Permission for use has been requested. Moral of the story? All these decades later it occurs to me that the moral may be that Catron, as a lawyer, was part of the “justice” system. Catron rose to district attorney, then acted briefly as U.S. Attorney, appointed by President Grant. As Catron gained prominence in the Republican party he worked toward statehood for New Mexico. To be closer to his friends in the territory’s legislature, he moved from Las Cruces to Santa Fe. In fact, a short street behind the district courthouse in Santa Fe is named, Catron Street. It’s just a few blocks from Grant Street and the courthouse where Tijerina was arraigned. The Old West Land Grant story suggests barbed wire keeping people and animals in areas defined by power, not justice. In case it doesn’t go without saying, Judge Chavez decided in favor of Frank Gomez. 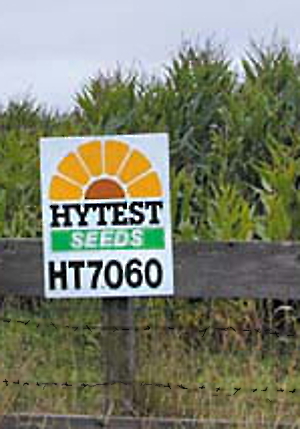 Today, barbed wire and judges like Clarence Thomas in the U.S. Supreme Court, who worked as a lawyer for Monsanto, protect Monsanto RoundUp Ready Corn crops, whereas you might expect the health of people to be protected by justice and the law. The difference in nutrition content of GMO vs Non-GMO corn affects health. Read more. This site, however, is not about legal battles concerning GMO corn, it is about the battles you may face where “justice” is controlled by banks, lenders, developers, the IRS and others whose unjust aims and power are dangerous barbs in what otherwise would be the justice system. You may not be able to win in a foreclosure action brought by a bank using fraud and lawyers not unlike Catron, in terms of morality, but the experience you gain may still aid you. By citing the ADA, I was able to show I should not be charged by a hospital. Read more. If you are unlucky enough to have an invisible disability, like a brain injury, your chances of success in court are pretty similar to mine before Quate Chavez. Accommodation of a disability is required under the ADA but that doesn’t mean you can get it. Not getting accommodation affected my health as well as the case. Read more. I have lost many, many legal battles where the law was on my side, but the judge had something else in mind. Nevertheless, I believe that as more Americans become aware of due process, our Fifth Amendment right which provides that courts may not deprive citizens of “life, liberty, or property” without following proper, established procedures, to include proper notification, things will change. It is our preponderance of ignorance that allows courts to decide with prejudice. 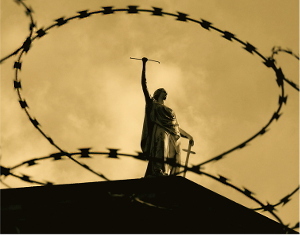 We can change barbed wire justice to proper justice by appreciating that justice rests on principles that are so important they were put into the Bill of Rights. What good, after all, is a promise of Free Speech or Gun Rights if there’s no underlying justice? Justice is often portrayed as evenly balanced scales. In actual fact justice often has a barbed character due to judicial prejudice. How can we combat that?